A friend told me that there has been an apple recall. She said only certain varieties were affected, but couldn’t remember which ones. Where can I learn more about this kind of thing? There actually have been two recent recalls related to apples, both of which were linked to a bacterium called Listeria monocytogenes. It is a deadly pathogen and you’re lucky to have a friend who will warn you about such recalls. One recall began because of an ongoing outbreak of L. monocytogenes. The outbreak was traced to commercially produced caramel apples made from Gala and Granny Smith apples grown and processed by a company in California, Bidart Bros. Seven people have died in the outbreak, and 31 were hospitalized in 11 states around the country. At first, just caramel apples were recalled, but when L. monocytogenes was found at the company’s apple-packing facility, the firm recalled all of its Gala and Granny Smith apples. You should know that these are two of the most widely grown apple varieties, and apples from other growers and processors are not linked to this outbreak. 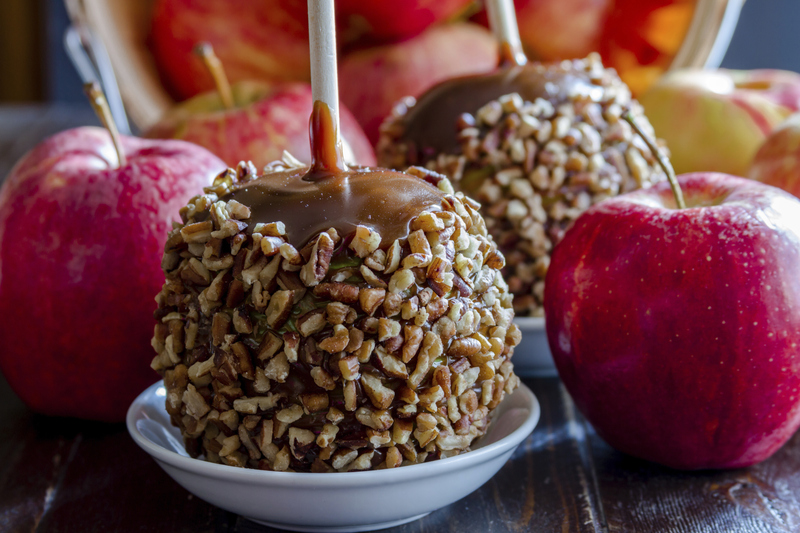 However, if you have caramel apples at home purchased before Dec. 24, 2014, or Gala or Granny Smith apples purchased before Jan. 6, and you’re not sure if they are affected, check the advisory from the Centers of Disease Control and Prevention at cdc.gov/listeria/outbreaks/caramel-apples-12-14/advice-consumers.html, or check with your grocery store. If you do have them, throw them away immediately. Place them in a closed plastic bag in a sealed trash to prevent other people or animals from eating them. Although L. monocytogenes accounts for a relatively small fraction of foodborne illness, it’s particularly lethal: An estimated 18 percent of those who contract listeriosis die. Most at risk are older adults; pregnant women; patients undergoing cancer treatment, transplants or receiving medications that suppress the immune system; people with AIDS or other immuno-compromising conditions, such as liver or kidney disease or insulin-dependent diabetes; and small children. There was another recall on Dec. 10, 2014, for fresh-cut Gala apples grown in Pennsylvania and prepared and distributed by Del Monte Fresh. No illnesses have been reported related to this recall, but a random test by the Ohio Department of Agriculture found L. monocytogenes on the fresh-cut fruit. Grocery stores often used these apples in snack packs and other packaged, ready-to-eat fruit bowls. It’s not likely anyone would still have these items on hand, but a complete list of products affected is online at www.fda.gov/Safety/Recalls/ucm426419.htm. 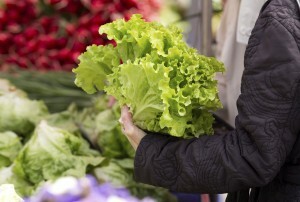 The best place to look for recalls of fresh produce and other products regulated by the Food and Drug Administration is www.fda.gov/Safety/Recalls. This website has an easy-to-use search function to help you find details quickly. Also, you can see recently recalled foods at foodsafety.gov/recalls, which includes foods regulated by both the FDA and the U.S. Department of Agriculture (primarily meat products). Editor: This column was reviewed by Sanja Ilic, food safety specialist for Ohio State University Extension, the outreach arm of Ohio State University’s College of Food, Agricultural, and Environmental Sciences. My children always eat their breakfast and lunch at school. Money is tight, and we don’t always have extra food on hand, which is a problem when school is canceled at the last minute because of the weather. I don’t want my children to go hungry just because school is closed. Any ideas? First, you’re not alone. During last year’s severe winter, many officials voiced concern about whether some students would have enough to eat at home when schools closed due to weather. And now, a new national study by the Southern Education Foundation found that 51 percent of children in the nation’s public schools, pre-kindergarten through high school, were eligible to receive free or reduced-price lunches in 2013. This is the first time in recent history that a majority of students in public schools come from low-income families. When money is so tight that a family has to make hard choices between paying for food or other necessities, it’s a significant challenge to plan ahead for something like meals for snow days. Good for you for thinking of this. Dry beans. Ounce for ounce, dry beans are a bargain. The website “The Simple Dollar” (thesimpledollar.com) recently did a cost comparison, which found that a one-pound bag of dried beans yielded eight cups of cooked beans at an average cost of $1.99, while a can of cooked beans, at an average cost of $1.19, yielded just two cups. If you’ve never used dried beans, you need to be aware that they take time to prepare ­— at least an hour using a “quick-soak” method. The Bean Institute offers step-by-step instructions at beaninstitute.com/recipes/cooking-with-dry-beans. You’ll also likely want to experiment with herbs, spices and other flavorings to add to the cooked beans. It’s recommended that dried beans be stored in an airtight container and be used within a year of purchase for the best quality. Potatoes. Raw potatoes will last several weeks in the pantry — longer if you can store them in a place that stays cool (50-60 degrees F). They’re easy to cook in the oven or the microwave. Top them with some cheese and chopped tomatoes (fresh or canned), and your kids will have a hearty meal. Canned tuna, chicken, fruit and vegetables. Canned goods last a long time in the pantry — a year or longer. Keep a few of these staples tucked in a back corner for use in emergencies. Aside from stocking up, you should be sure you’re getting the assistance you are eligible to receive. The U.S. Department of Agriculture offers a list of resources online at snap.nal.usda.gov/resource-library/need-food, including the National Hunger Hotline (1-866-348-6479, or in Spanish at 1-877-842-6273). Ohio also has a Supplemental Nutrition Assistance Program hotline, at 1-866-244-0071. Editor: This column was reviewed by Irene Hatsu, food security specialist for Ohio State University Extension, the outreach arm of Ohio State University’s College of Food, Agricultural, and Environmental Sciences. Over the holidays, my sister and I were eating caramel candy, and she mentioned how much she loves caramel flavoring. I thought caramel wasn’t really a flavoring added to the candy, but a byproduct created from cooking sugar. Who is right? You’re both sort of right. Caramel flavoring is a real product. If you can’t find it in your grocery store, you can buy it online. Whether the candies you were eating had caramel flavoring in them is impossible to say without looking at the ingredients. But, odd as it sounds to some people, caramels don’t need caramel flavoring as an ingredient because caramelization does, in fact, occur when sugars are cooked the right way. 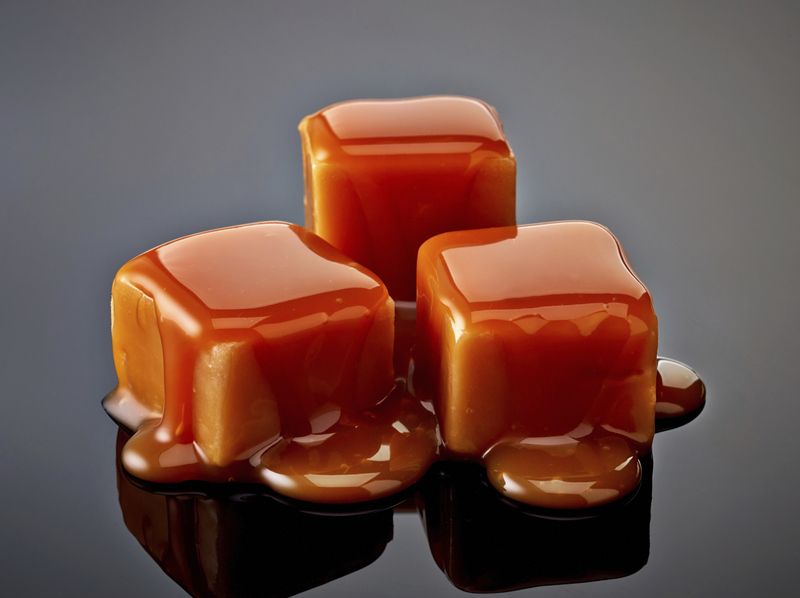 Harold McGee’s quintessential “On Food and Cooking: The Science and Lore of the Kitchen” (Scribner, 2004) offers a detailed description of the food chemistry behind both the flavor and texture behind caramelization, caramel syrup and caramel candies. The first step in making caramel candy is combining sugar and water to make syrup: Candy makers need to combine them in the right proportion, heat the resulting syrup to the right temperature, and then cool the hot syrup properly to create the chewy caramel texture. When sugar (or salt, for that matter) is dissolved in water, the solution boils at a higher temperature than plain water does. But as the syrup heats up, the water evaporates more quickly, and the syrup becomes more concentrated, browning as it heats and producing new flavors as a result. As the syrup thickens, the solution can become hotter and hotter very rapidly, and the whole thing can scorch if you’re not careful. Generally, a syrup with a higher water-to-sugar ratio will result in a softer candy. If you boil too much of the water off, you’ll end up with harder candy. To make caramels, the solution should be one that boils at 245 to 250 degrees F. When it reaches that stage, the solution is between 85 and 90 percent sugar — just the right concentration for caramels. But then it has to be cooled properly so the sugar doesn’t crystalize. If crystals form, you’ll get a grainy instead of a smooth caramel. The formation of crystals depends on a lot of things: how quickly the solution is cooled; what is added to the syrup, such as milk products and butter; and even the temperature of the solution when you start to stir it. Purified versions of caramel syrup are commonly used as both a flavoring and as a deep brown food coloring for soft drinks, prepared foods and many other products. Adding milk to the syrup does a few things: the casein from milk helps make the caramel chewy, and the whey proteins brown easily, helping provide that characteristic flavor. Butterfat also helps provide both the proper texture and familiar flavor of caramels. Other flavor agents, such as vanilla, can also be added. Making caramels, or any sort of candy, really, is both an art and a science. That should give you something to chew on the next time you enjoy caramel candies. Editor: This column was reviewed by Mary Kay Pohlschneider, lecturer in the Department of Food Science and Technology in Ohio State University’s College of Food, Agricultural, and Environmental Sciences. Two of my New Year’s resolutions are to eat more fruits and vegetables and to spend less at the grocery store. Other than watching for sales on produce, what are some ideas to help? Those are two great resolutions. The U.S. Dietary Guidelines recommend that adults get two to three cups of vegetables and 1.5 to two cups of fruit a day. Keep in mind that it’s important to get a wide variety. Apples and green beans are fine, but you’ll want to spread your wings a bit and eat other types of produce to get the benefits you’re looking for from fruits and vegetables. And you don’t have to assume that eating more healthfully will be more expensive. 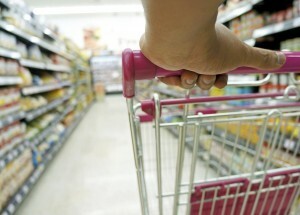 A 2012 study by the Economic Research Service, “Are Healthy Foods Really More Expensive?” found that healthy foods, including fruits and vegetables, are often less expensive per serving than foods that are higher in saturated fat, added sugar or sodium or that contribute little to meeting the dietary recommendations. So, if you’re smart about buying fruits and vegetables and at the same time buy fewer less-healthy foods, your grocery bill could easily go down. Don’t forget the canned and frozen sections of the grocery store. As long as you have the pantry and freezer space, here’s where sales can really help trim costs. Store brands are normally the most economical, but sometimes price reductions on name brands will surprise you, especially if you have a coupon. For health, look for low-sodium canned goods and frozen produce without added sugar or sauces. If you have options on where to shop, check them out. 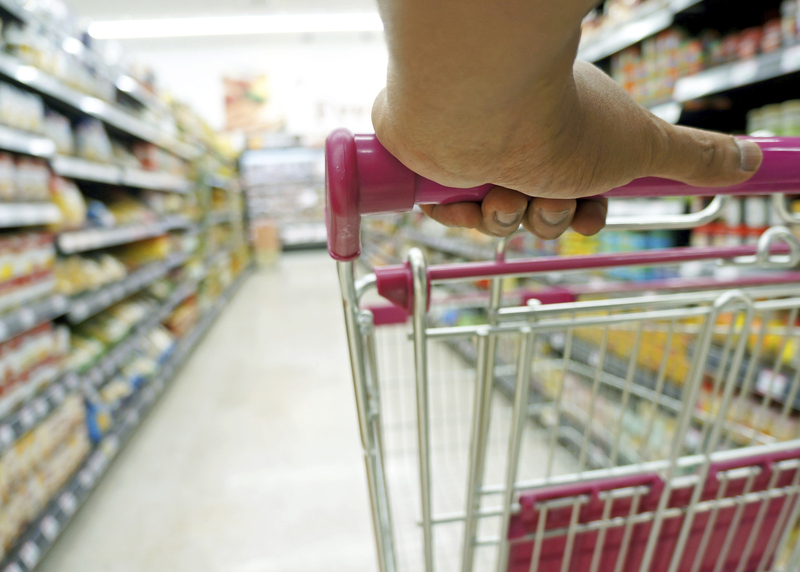 Many people head to the nearest grocery store out of convenience, but better deals could be just down the road. Just be cautious about impulse purchases: Shopping at additional stores provides more opportunities to spend money you didn’t plan on. And don’t be tempted to drive so far that the cost of gas undermines your grocery savings. Be sure to eat what you have on hand before it goes bad. According to a 2014 Economic Research Service report, American consumers throw away 90 billion pounds of food per year, including 9.5 billion pounds of fresh fruit and 12.8 billion pounds of fresh vegetables. That’s not only wasted food, but money down the drain. To reduce waste, plan meals and snacks, and purchase only what your family can eat while it’s fresh. And keep fresh produce as visible as possible — in a bowl on the kitchen counter (if it doesn’t have to be kept cool) or at the front of the refrigerator. Editor: This column was reviewed by Dan Remley, field specialist in Food, Nutrition and Wellness for Ohio State University Extension, the outreach arm of the College of Food, Agricultural, and Environmental Sciences. For a PDF of this column, newly redesigned, please click here.